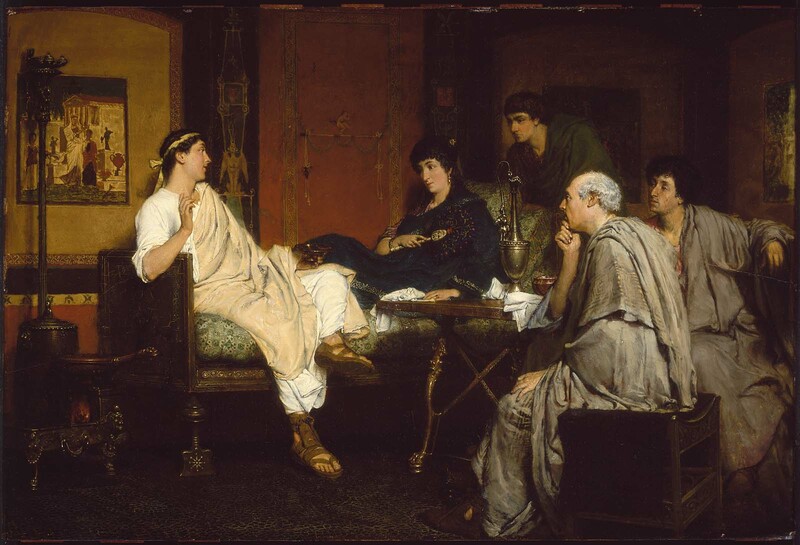 The Roman poet Tibullus is shown reciting to a group of friends in the house of his mistress, Delia. Alma-Tadema achieved extraordinary social and financial success for reconstructions of antiquity that gave late-nineteenth-century audiences an imaginary glimpse into a world very different from their own. Many of the impeccably rendered furnishings, such as the bronze stool and folding table and the painting behind Tibullus, represent actual objects found in the ruins of Pompeii. This painting, executed in 1866, was one of twenty-four paintings that the art dealer Ernest Gambart ordered from Alma-Tadema in 1864. It was exhibited at Gambart's London gallery in 1867. See Jennifer Gordon Lovett and William R. Johnston, Empires Restored, Elysium Revisited: The Art of Sir Lawrence Alma-Tadema (Williamstown, MA, 1992), pp. 49-50, cat. no. 7. W. Prescott Hunt lent a "Pompeian Interior" by Alma-Tadema to the Allston Club, Boston, in 1867, but whether it is identical to the MFA painting is not known. The MFA painting was certainly lent in 1896-97 to the First Annual Exhibition, Carnegie Art Galleries, Pittsburgh (no. 1), but the lender's name is not given in the catalogue. A signed letter from T. J. Blakeslee (April 28, 1902) attests that this is one of a group of paintings Evans bought from the gallery on January 8, February 20, and March 11, 1902.